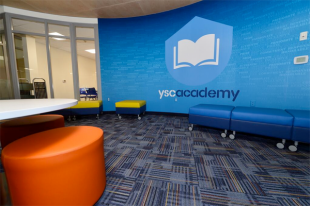 On Tuesday, the Union officially opened the new YSC Academy which combines academics and soccer training. YSC Sports founder and Union investor Rich Graham said, “This is an idea I’ve had for many years. I’ve always thought that in American soccer we need to get organized, we need to get systematic about how we’re developing our talent so that we can compete at a global level. And the reason why I invested in MLS is I believe in the American dream. I want to see American players. I want to see us produce 10 Landon Donovans. I want to see us win a World Cup. This all is about what steps can we take to help prepare the United States to compete at a global level. Hackworth said, “We know that it will be a small percentage of student-athletes here that actually make it. But the point is that now they have a true path and an opportunity that is, to me, the most authentic and unique of any professional team in the United States or Canada. At the Delco Times, Matthew De Gorge talks to the head of the school, Dr. Nooha Ahmed-Lee, and has a closer look at the new school’s classroom philosophy and facilities. Fabinho has been named to MLS soccer.com’s Team of the Week. “Sheanon Williams (Seattle Sounders)” was named to the bench. Sebastien Le Toux came in at No. 13, and Sheanon Williams at No. 16, in the latest Castrol Index Weekly Top 20. In the Full Castrol Index, the top five Union players are Jack McInerney (No. 8), Conor Casey (No. 19), Zac MacMath (No. 36), Sebastien Le Toux (No. 39), and Amobi Okugo (No. 49). More power rankings! MLSsoccer.com moves the Union up three spots to No. 10. ESPN keeps them at No. 12. The Union is one of the partners in the three-year, $2.7 million “Healthy Futures” program, the Independence Blue Cross initiative aimed at promoting healthy lifestyle choices that will take place in 20 area schools. Brotherly Game contributors debate who should start at left back, Fabinho or Ray Gaddis. Turns out to be not much of a debate. Harrisburg City Islanders forward Sainey Touray has been named to the USL Pro All-League First Team. Goalkeeper Nick Noble and forward Lucky Mkosana received second team honors. More on the news from Penn Live.com. The La Salle men’s team home season kicks off today at 7 pm against Loyola (Md.). Four area players have been named to the fall class of the U-17 residency program in Brandenton: goalkeeper Kevin Silva (PDA; Bethlehem, Pa.) defender Matthew Olosunde (New York Red Bulls Academy; Trenton, N.J.), midfielder Thomas McCabe (PDA; South Orange, N.J.), and forward Christian Pulisic (PA Classics; Hershey, Pa.). Union fans will want to keep an eye on tonight’s game between Columbus and Houston (7:30 pm, MLS Live). The Crew, in eighth place with 29 points, have a new interim coach. Houston is in sixth place with 37 points, only two points behind the fourth place Union. Also playing tonight are Seattle and Chivas USA (10 pm MLS Live). Robbie Keane, who scored two goals and an assist in LA’s 3-0 win over San Jose, has been named MLSsoccer.com’s Player of the Week for the second time in three weeks. Tim Cahill is out 3-4 weeks with a ligament tear in his right ankle. ProSoccerTalk says the league schedule could be reduced from 34 to 28 games. There seems to be a discrepancy between the attendance figures reported by Orlando City Lions and the turnstile records kept by the city of Orlando. The Oklahoma Gazette on rival NASL and USL PRO franchises in Oklahoma City. Think Progress.org has a long and wide-ranging piece on the league’s hopes to succeed where its predecessors have failed. The Boston Breakers have named Tom Durkin as their new head coach. After landing at Juan Santamaría International Airport in Costa Rica, the USMNT was greeted by jeering chants of “USA – No fari play” and the team bus was pelted with eggs. Stay classy, Costa Rica. There would be no better feeling than standing on the field in Columbus on Tuesday night and all of us celebrating. I can envision scarves around our neck, American flags, the crowd going crazy and everybody celebrating together. That would be an incredible moment, but there is a lot that has to happen before that. The beauty of it is that it’s all in our hands. Soccer Insider lays out the scenarios for the US clinching a World Cup spot in Costa Rica or Columbus. Soccer America sets the background for the game in Costa Rica. In Scotland, The Herald says that the Scottish national team is close to announcing a friendly against the US to be played at Hampden Park in November. The USWNT trounced Mexico 7-0 in Tuesday’s friendly at RFK. Sydney Leroux scored a hat trick in 9 minutes before adding a fourth goal little more than ten minutes later. Abby Wambach opened the scoring to record her 161st international goal and also had three assists. Rachel Beuhler also scored as did newcomer Morgan Brian. Former Philadelphia Independence defender Leigh Ann Robinson earned her first cap. Here’s a Q&A with US Soccer director of scouting Tony Lepore. SBI recaps the summer transfer window in Europe. More than $2.3 billion was spent by Europe’s top five leagues. Nearly $980 million of that was spent by the Premier League. very cooool video! thanks for posting! Wow that Kleberson article is really damning to me. I know there was a piece written on this earlier in the year but how the hell are we one of the most cash strapped teams in the league? It can’t possibly be due to ticket sales or merchandise bc we seem to be right even with the majority. Are our owners really that small pocketed? Have we been cursed with the indie movie of sports teams? Basically, yes, especially compared to most of the other teams in MLS. Remember when the Union were going to develop the area around PPL Park and, perhaps more importantly, create their own training ground? We may not be a small market team, but we have small market ownership. Well maybe this article on how Union Owner Jay Sugarman was awarded a 26 million dollar compensation deal (mostly stock so probably worthless) to run a company that lost 62 million dollars last year will give you an idea on why at best money isn’t being put into the Union at worst money is getting bled out for equity. I swear the entire team is a monument to failing upwards. This will turn into a disaster since more and more other clubs are spending the $’s (Donovan with his new contract, Dempsey to Seattle on high wages, etc). Actually heard that one team wanted Kaka real badly and that Kaka would have come had the US window closed on September 2, as everywhere else. Am sure it was not the Union they referred to… Ultimately we will become less of a play-off contender. Glad to see Davis pointing out that the Union’s pockets appear to be empty. It’s a problem this year but it’s going to be an even bigger problem going forward. Pelted with eggs? Wouldn’t snowballs have been more appropriate? The Fabinho/Gaddis debate is a good one. One in which I think everyone knows their pros/cons. Personally I would start by leaving Ray at LB and Move Cruz to LM. He can’t do worse than Cruz, and I think that gets more talent on the field for us. If they reduce the schedule by 3 home games, I wonder if we get a partial refund on our season tickets. Shout out to Sak for emphasizing how expensive the academy is, implying that the Union are funding it. Can anybody make sense of what he said about the metric? Is the metric starting academy players or something to be determined after 10 years? I feel like the metric will be the amount of money the FO has made in transfer fees from selling off their Academy-grown players. yes but isn’t that how 99% of youth academies are measured?